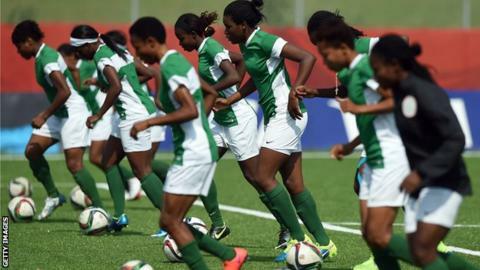 The Nigeria Football Federation (NFF) has rued its women's team's failure to qualify for the 2016 Olympic football tournament in Brazil. The reigning African champions suffered a 2-1 defeat in Equatorial Guinea on Sunday to crash out 3-2 on aggregate. The exit completes back-to-back Olympic disappointments for the Super Falcons. Equatorial Guinea will now play off against South Africa for a place in the Olympics, while Cameroon take on Ivory Coast for the other African berth. "It's an unfortunate disappointment," NFF spokesman Ademola Olajire told BBC Sport. "The NFF made strong effort to ensure qualification but the first leg result proved a mountain to climb in Bata." The seven-time African champions, who are still searching for a substantive coach, were without several regulars including injured BBC Footballer of the Year Asisat Oshoala. "They missed seven key players who were unavailable due to club engagements or injuries but that is football," added Olajire. NFF president Amaju Pinnick says it's time to have a top-to-bottom look at what is wrong with the women's game following Nigeria's group stage exit at this year's Fifa World Cup. "The NFF president has quickly announced that there's no quick fix and that we need a much broader review," said Olajire. "We have to fast-track our entire plans for the revival of the women's game from the coaching situation to sponsorship. "There's no point just changing the coach hoping for the best without putting the structures in place. The immediate plan now is to restructure the women's league, implement all the professional plans of the NFF board to ensure the successful change is a permanent one." BBC Sport understands that the NFF is determined to appoint a foreign coach for the women's side to replace sacked Edwin Okon. Christopher Danjuma was appointed as caretaker-coach in the wake of Okon's sacking but lacks the experience to revive the faltering Falcons. Continental powerhouse Nigeria is the only African team to have played in all Fifa Women's World Cup tournaments since 1991. But they have failed to translate their continental dominance on the world stage, as their best performance came in the USA in 1999 when they reached the quarter-finals. In Sunday's other match, South Africa advanced with a 1-0 win over hosts Kenya, as Rhoda Muluadzi's 24th-minute goal completed a 2-0 aggregate win. "We have always thoughts Nigeria would be our final opponents but at the back of our minds, we also knew there was a chance we could play Equatorial Guinea," coach Vera Pauw told the South African FA website. "But the truth is Equatorial Guinea will not be weaker than Nigeria. The fact that they won against Nigeria means it will be a tough encounter. We have the African Games to help us prepare by keeping us sharp." On Saturday in Accra, visitors Cameroon edged past Ghana thanks to the away goals after a 2-2 draw meant the tie ended 3-3 overall. Samira Suleman put the hosts ahead in the 15th minute before Cameroon drew level a minute before the break through Ngono Mani Madelaine. Two minutes into the second half, Portia Boakye restored Ghana's lead but Agnes Nkada broke Ghanaian hearts with an equalizer seven minutes before the final whistle. Zimbabwe's place in the next round is a result of Ivory Coast withdrawing before their second-leg match. But Zimbabwe, who failed to travel to Ivory Coast for the first leg and were penalised with a 3-0 walkover, must first give assurances to Fifa that they have the funds to play home and away against Cameroon.